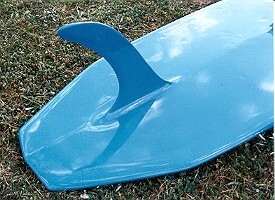 Stringerless foam blank, volan laminate with Hour-glass patch, post-production blue spray on bottom to overlap. Deck: clear, with post-production blue spray to overlap. Bottom: clear with post-production blue spray on bottom. Photographed at DV8 Old Mal Rally, Shellharour, 13th April 2002. Very unusual (Wedge, Chisel, Screwdriver) tail, evidence of the wide range of design experimentation in this period. note WM #3and early Mark Richards' board, in Knox : Mark Richards, page 30. 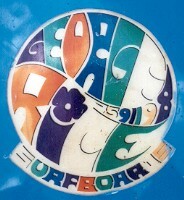 The expensive large decal was designed by Vicki, the then current female companion of shaper, Paul Pascoe. Magazine Article : Longboarding MagazineNo 20 March/April 2002, pages 44 to 53. See below. 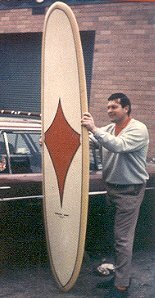 George Rice and Stringerless Mini gun pintail, West Heidelberg factory, circa 1968. From... Longboarding Magazine No 20 March/April 2002, page 44.